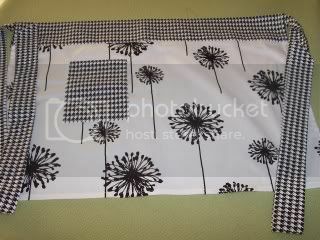 Who wouldn't want to wear this adorable crisp black and white dandelion print 1/2 apron with black and white houndstooth check accents! Half apron measures 16 long x 24 wide with a 3 waistbanding and 2 wide straps that are a generous 36 long. Also has a nice 5x6 coordinating print pocket. 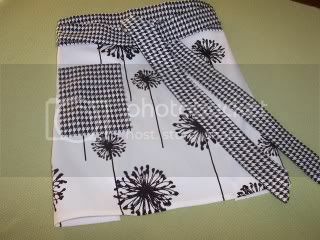 Two fun designer washable cotton fabrics=one very stylish apron! Great hostess or bridal gift idea!